The 20 effortlessly stylish suites are of impressive proportions – and so is the outlook. The complete glass frontage captures the dynamic theatre of The Hazards with its glowing pink sheen on daybreak, to its mellow mood at dusk. The design for Saffire is inspired by the landscape and our aim was always to give the sanctuary a sense of place by incorporating the tones, textures and hues of the locale. Schouten Island half day experience – Come aboard our Saffire vessel and enjoy an entrée-sized portion of the Schouten Island Signature Experience. Be engaged by close-up interactions with scouring sea birds, playful marine mammals and a diversity of life on Tasmania’s temperate reefs. The adventure also includes a visit to culturally significant sites of past and present inhabitants. 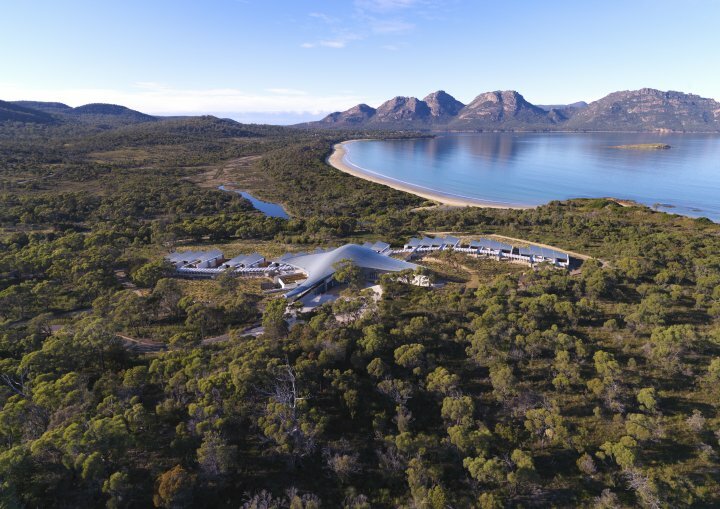 Behold the beauty of the Freycinet Peninsula and discover Schouten Island on this memorable three-hour adventure. Morning tea is included and prepared by the team of chefs at Saffire. Bookings essential, cost $250 per person, minimum four people.